Rural Pennsylvania defines Allison to this day. Her hard-working mantra made her a collegiate athlete and a figure champion. This country gal thrives outside her comfort zone! Age: 28 Height: 5'6 1/2"
In some way, shape, or form, I was born into a future including athletics. As a child, I was incredibly active. I grew up in rural Pennsylvania on a farm with my parents and my younger brother. I rode horses, ran, swam, and played sports. I did youth league soccer and softball, then progressed to field hockey and track, and ended with indoor track and cross country in high school. I went to college as a cross country athlete, but only ran competitively on the collegiate circuit during my freshmen year. My introduction to physique competition stemmed from my love of the gym, lifting, high-intensity training, and my desire for a competitive outlet. I competed in my first figure show at age 20 at a small local NABBA show with the help of a local bodybuilder. As soon as I set foot onstage, I knew I had found something I was passionate about. I competed in my first NPC show in the fall of 2007 at age 23 in the NPC Reading Mountain Valley. I won my class, overall figure, qualified for nationals, and have competed nationally ever since. I've been training for the better part of a decade, so I've tried a variety of different training methods. The smartest athletes are also the most scholarly— they become students of their physique and learn constantly through trial and error. The best combination of training for my body is mix of HIIT, running, CrossFit, metabolic conditioning (MetCon) work, plyometrics, and standard bodybuilding isolation moves. I don't do much long steady-state cardio as it tends to turn me into a string bean. After 10 years of training, I've learned that I need more CNS (central nervous system) stimulation than the standard set and rep bodybuilding training. I de-load or reduce my intensity every 6-8 weeks, which is incredibly important. I take one day off per week, whether I need it or not. If I'm tired or overly sore, I adjust my planned workout accordingly or eliminate it. I listen to my body. My training changes weekly—it's important I state that. I believe in variety and constantly stimulating growth to keep myself mentally engaged. Sometimes I make small changes with grips for pull-ups, or change entire MetCons. I never do the same exercises. The following is a sample of what I currently do. Editor's Note: Any compound lift can be used in Tabata style training. The front squat will be used as our example. Select a light weight to perform with, say 30-50% of your one-rep max. Have a friend with a stopwatch nearby. Once you unrack the weight, your time will start. In 20 seconds, complete as many front squats as you can. At the end of 20 seconds, you have 10 seconds to rack the weight, rest, and unrack the weight. When your ten seconds are up, you had better be in position to start the next round, because you are going to do this seven more times! In four minutes, you will perform eight sets of front squats. One-on-one session with my coach, Jeremiah Williams from the Crossfit Collective. I'm a staunch paleo athlete and have been for more than a year now. I'm deeply rooted in the lifestyle and strongly believe in its effectiveness, especially for athletes. I consume no grains, legumes, dairy, or sugars. That eliminates lots of bodybuilding staples like Greek yogurt, oatmeal, brown rice, Ezekiel breads, peanut butter, and shakes. I eat clean year-round. I don't eat junk or believe I need to eat junk to create the physique I want. I fuel my body with the food it needs to sustain a lean physique effortlessly and to offer up optimum performance in the gym. My favorite treat meal is a filet, plain sweet potato, side salad, and asparagus from Outback Steakhouse. I'm an athlete at heart. I don't know a life without fitness. Although what I do in the gym may change, training has always been stimulating, mentally and physically. I'm very intrinsically motivated—I have a deep desire to continue growing and challenging myself. If it doesn't challenge you, it doesn't change you. Every workout and training session should lift you physically and spiritually. Your workouts should move you, change you, and send you out through the doors a better version of yourself. I'm a very musically motivated athlete. A surefire way to get me ready to train is to update my iPod with new tunes. I love watching motivational YouTube training videos, especially those involving Erin Stern, whom I admire. I also pray if I'm struggling for motivation. I rely heavily on my faith in God for the strength to give 100 percent during my workouts. I truly hope I never stop evolving as an athlete. Currently, I've registered to run my first Spartan Race in 2013 and I've become a staunch believer in the power of CrossFit. 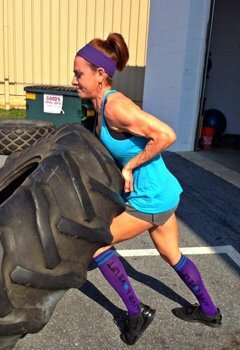 In February of 2013, I will have a Level 1 CrossFit certification, which I'm excited about. Aside from that, I plan to be onstage in figure in 2013 and continue modeling. I'm very proud of the evolution of Alli-Fitness Systems LLC and the growth of my paleo/primal training approach programming through www.predator-diet.com and will continue working hard to foster those endeavors. Don't be afraid to step off the beaten path. Growth occurs outside your comfort zone. As athletes, we should never cease to seek, learn, grow, and evolve. There is never only one way. My favorite figure athlete is Erin Stern. I admire her incredible physique, her mindset toward life balance and competing, the unique manner in which she incorporates a variety of methods into her athletic training, and how professional and warm she is in person. Aside from Erin Stern, I admire Kim Dolan Leto and Alicia Marie. Bodybuilding.com was the first website I came across in my early 20s that gave me insight into the fitness industry. I ordered supplements, browsed BodySpace, and read solid training and nutrition articles authored by well-rounded and educated individuals.